Located between Yasaka Shrine, famed for its Gion Matsuri, and Kiyomizudera, known for its enormous wooden stage, stands the 46 meter high Yasaka Pagoda, built around a single wooden shaft. The pagoda’s official name is Hokanji (法観寺). This buddhist temple was founded by Shotoku Taishi (573–621) and occupied once a large area in Kyoto’s Higashiyama district. Only the pagoda has survived, but it stands proudly among the small houses of this area. 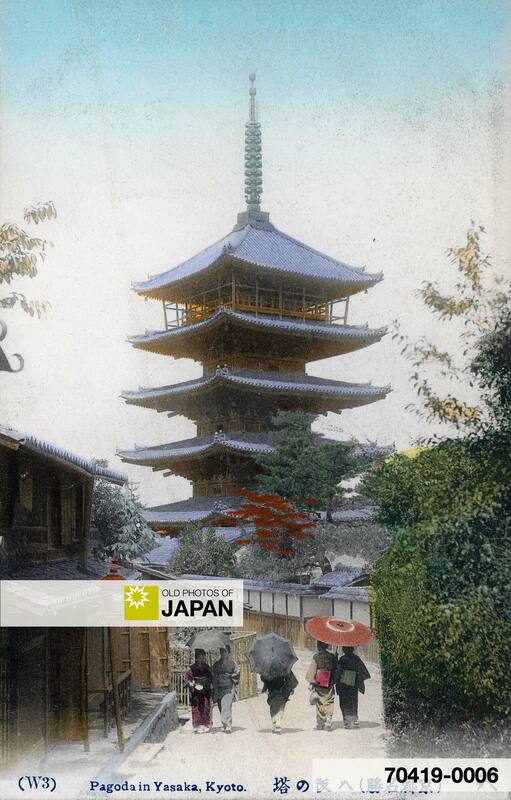 The pagoda burned down in 1179 when Kiyomizudera had a disagreement with Yasaka Shrine. Shogun Minamoto Yorimoto (1147-1199) had it reconstructed in 1191, but it was destroyed by fire in 1291, and again in 1436. The current building was erected in 1440 by Shogun Yoshinori Ashikaga (1394-1441). The pagoda is one of my favorite spots in Kyoto. It lies slightly off the major tourist routes, so you can often wander the street in front of it all by yourself. Unfortunately, in spite of its celebrated image as a symbol of Kyoto, electrical lines have destroyed the view. However, on nearby streets these are now in the process of being put underground, so there is hope that the view on the pagoda may be restored as well. Yasaka Pagoda is a popular subject of ukiyoe prints. You can also licence this image online: 70419-0006 @ MeijiShowa.com.